January « 2009 « Welcome to Property Source Nation! 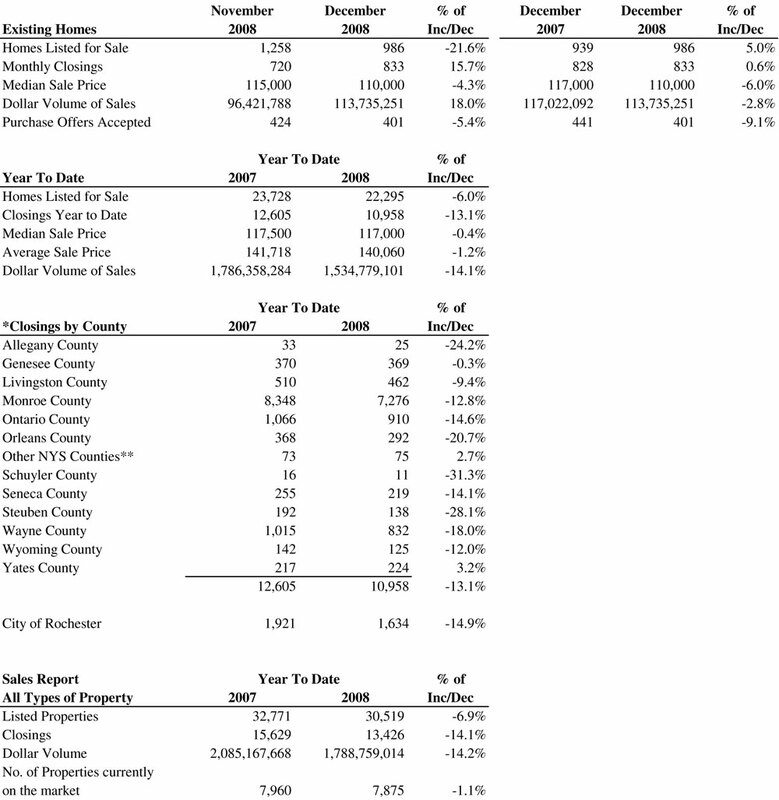 This past month there was a 0.6 percent increase in monthly closings and a 5 percent increase in homes listed for sale as compared to December of 2007 according to statistics released by the Genesee Region Real Estate Information Service (GENRIS), the information subsidiary of GRAR. The median sale price for our area is down 0.4 percent at $117,000 year-to-date. Locally, Monroe County finished 2008 down 12.8 percent in number of closings year-to-date compared to 2007 while the City of Rochester ended ’08 down 14.9 percent. The surrounding counties of the Greater Rochester MSA, specifically Yates County showed positive activity all throughout 2008 ending with a 3.2 percent increase in monthly closings year to-date. With holidays and the weather as it is this time of year, a seasonal slowdown in the market is to be expected. However, we urge residents of our region to be optimistic about our market – while we may not experience the housing booms that have occurred elsewhere, we are also fortunate that we do not experience the dramatic decreases in sales either, as other parts of the country currently are. Interest rates are historically low and real estate is local. Chuck Hilbert, President Greater Rochester Association of REALTORS®, Inc.
Bob Maves was named “Mentor of the Year” and Patti Kesselring was honored as “Humanitarian of the Year” by the Rochester Chapter of the Women’s Council of REALTORS®. The awards were distributed at the WCR annual holiday event held last month. Bob Maves, Associate Broker and Branch Manager of Nothnagle’s Pittsford office, was nominated for his coaching style and commitment to the success of every agent in his office. He also has served in the past year in a leadership capacity at the Greater Rochester Association of REALTORS®, on their Board of Directors and as Chairman of the Genesee Region Real Estate Information Service, Inc. (GENRIS), which manages the local Multiple Listing Service (MLS). Patti Kesselring, an Associate Broker with the Pittsford branch of Nothnagle Realtors, won “Humanitarian of the Year” for her dedication and commitment to numerous organizations and causes within our community over the years. In 2008, Patti headed up a team for the American Cancer Society Walk and a fundraiser for the Al Sigl Center, in addition to activities to raise awareness and funds for breast cancer research. The market is tough. There is no reason to sugar coat it. Many Agents are experiencing challenges for the first time in their real estate career. Clients with strong credit are being challenged by the lenders. Homeowners are not putting homes on the market. Buyers are submitting low ball offers. Foreclosure and short sales are happening in record numbers. Buyers are negotiating harder. There are obstacles at all stages of the transaction. On top of all these issues people are frozen waiting to see what will happen with their jobs, the economic bail out, Wall Street, and the Madoff scandal just adds to the uncertainty. An Agent Client and I looked at her numbers for the year and we realized that out of forty three deals she had had eleven deals die. The year before in 2007 she had four out of fifty die; the year before that she had forty nine, with no dead deals. Unfortunately, this is not uncommon. Fortunately, it is not all gloom and doom. The truth is that many Agents will not survive this era. But those that know how to or learn how to get through it will not only survive they will thrive in the healthy market that will follow. My Clients and many Agents are utilizing creative marketing and building their skills with their business practices to succeed. Here are some examples. 1. Freddie Mac has recently loosened their policy for the amount of short sales they will accept and I am sure many other lenders will follow suit. This will open up a stream of homes on the market. Yes they will be more difficult sales. And yes the Agents that learn to sell them will be more successful. 2. Investment Real Estate is extremely hot right now. The sharpest investors know that this is the best time to buy and they are out there looking for desperate Sellers. The sharpest Agents are honing their skills in finding and working with these savvy investors. An Agent Client in Southern California recently had an investor buy a 4-plex rental property for $84,000. That’s right I said $84,000 in southern California. The deals are out there. Real Estate continues to be the most safe, stable investment with the highest returns over the medium and long term. Income property investors have not only been unhurt in the present financial debacle, most are thriving. 3. Literally, there has not been a better time for first time home buyers in thirty years. The $7,500 tax credit now available, low interest rates, low prices, and lots of inventory to choose from; is a shopper’s dream. Agent Clients who have been fussy in the past about working in higher price ranges are exploiting the opportunity of first time Buyers. One said to me, it’s the easiest work she has done. She is strong, confident and bold about their opportunity. 4. Get to Know your Lenders. Instead of sending your Clients to the big lending houses, get to know your local banks. Create a relationship with the people there. They have portfolio money. They offer some of the best terms available and they are eager to lend. 5. Conventional 5% down mortgages with Seller Concessions are widely available. Ten or fifteen years ago it was unheard of for people to buy a home with no money down. You can easily thrive on what is available. Yes there may be additional paperwork, glitches and delays. That’s why you get paid so much. The not so secret, secret is simply to prepare your Buyers for this extra paperwork and the glitches and delays. Then when it happens they are ready for it and grateful to you for the heads up. Loans are still being funded so search them out and take advantage. 6. In some markets, short sales and foreclosures make up the majority of the sales. The Agents embracing the need to do what it takes to deal with these more difficult transactions are surviving. While those moaning, groaning and fighting over the more difficult transactions are going broke. Find Brokers that are dealing with these properties and align your self with them. 7. Be an expert. Right now people are afraid of Real Estate because of all the news reports. This is the time to effectively communicate to your spheres of influence and past clients what is really happening in the market. I suggest you send out a postcard this week with a headline that says “Find the Golden Opportunities in this Crisis.” Put on the mailing that this is a great time to buy. Describe some of the opportunities I have mentioned in this article. Inform your sphere that mortgage money is readily available. Be smart and find lenders to underwrite these postcards. When you are the voice of opportunity and optimism in this time of uncertainty you will both succeed through it and boom as the healthier market ensues. 8. Move up Buyers can buy property that was previously out of their reach. In every market there are modest price ranges that are pretty healthy and higher end price ranges that are pretty soft. Buyers are getting top dollar for the modest price ranges and truly amazing buys on property that they couldn’t afford two years ago. Find those price ranges in your market. Look for the modest home owners with stable investments and employment. You will make sales that will even surprise you. 9. Watch your numbers. Know what your goals are. Know how many appointments per week you need to reach your goals. Know your monthly open sales and listing goals. Compare your sales and listing results with previous years and against your goals. Smart, successful business people know to watch their numbers more carefully in a more challenging market. 10. Cut expenses. Yes I know this is self defeating as I am a Real Estate coach and coaching is an expense. More Agents are hiring me than ever before because of proven results. That’s the key. Cut expenses that don’t show proven results. Cut personal and professional expenses to a minimum. Your family will understand this is a temporary situation. Most importantly, now is the time to be positive, to be optimistic. You have a choice; you can dwell on the negative or search for the positive. You control your attitude at every moment. Learn to snap yourself into a peak state. Attitude is the only way you can survive this tough market with joy. The smart and resourceful Real Estate Agent will make it through. Find the opportunities. You have my sincerest wish for a successful year. 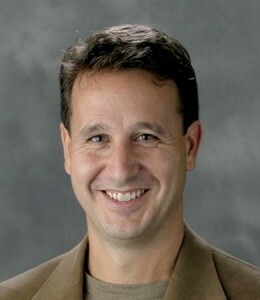 Rich Levin is a coach and speaker whose focus is teaching Agents to understand and control their business. Through that understanding achieve exceptional happiness and wealth in their life. Take control of your business, register for a free 2009 Strategy Session. Rich is President of Rich Levin’s Success Corps Inc.
To President Chuck Hilbert, the Greater Rochester Association of REALTORS® (GRAR) plays an important role not only in the success of its members, but also for the work it does on behalf of this community. A Rochester native, Chuck began his 22 years in real estate as part of a family firm — Hilbert Realty Inc. — and went on to run its Webster office. In November 2008, Hilbert Realty merged both of its offices into Keller Williams Realty Greater Rochester. Chuck is the Operating Principle/Broker in charge of this office. 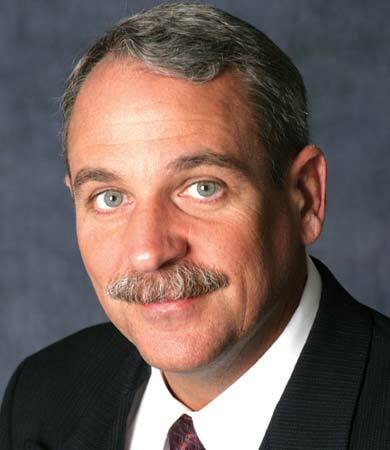 Prior to being elected as GRAR’s President, Chuck was on the board of directors for six years. He has been very active on many committees at the Association. He is also very active with the New York State Association of REALTORS® (NYSAR) and is on its Board of Directors as well as on the Board of Directors of the Delegate Body of the National Association of REALTORS® (NAR). Chuck has earned the GRAR Sales Master Gold and Platinum awards, and the 2003 GRAR REALTOR-Associate® of the Year. In 2005 REALTOR® Magazine, a national publication for the real estate industry did a feature article on Chuck and his wife Tiffany and two children CJ and Rachel. 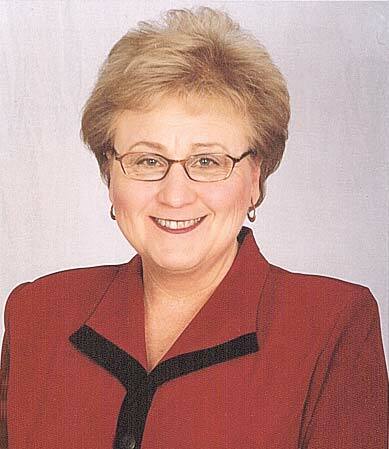 Carolyn Stiffler, ABR, e-Pro, SRES, has served on the GRAR Board of Directors since 2004. Becoming a Real Estate professional in 1989, Carolyn has owned and operated her office – Carolyn Stiffler Realty – in Greece serving her clients with dedication and expertise since 1999. In 2006, Carolyn was named the Business Person of the Year by the Greece Chamber of Commerce. “Carolyn is one of those success stories that we can proudly share with our daughters, sisters, and neighbors and who will serve as an example for achievement and excellence for our entire community,” stated Senator Robach. “Her name now joins that of other women such as Lucille Ball and Eleanor Roosevelt, whose accomplishments, sacrifices and deeds on behalf of others are deserving of special honor,” he added. Carolyn was also the recipient of the Women’s Council of REALTORS® – Rochester Chapter’s first ever “Businesswoman of the Year” Award in 2007. Presently Carolyn is part of the New York State Association of REALTORS® “Leadership Academy” and is in training for a future leadership role at the state level. She currently serves as a NYSAR Board of Director and will sit on several committees for 2009. 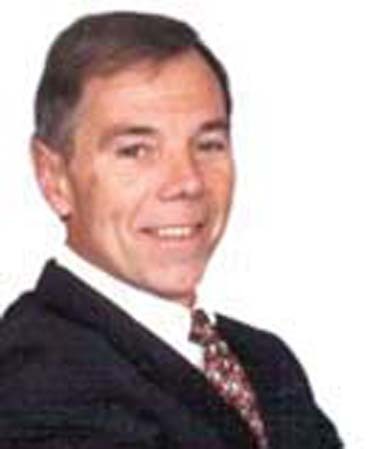 Licensed since 1979, Steve is an associate broker with RE/MAX Realty Group. With 30 years experience in real estate, Steve Babbitt has demonstrated a longstanding commitment to the real estate industry and holds numerous prestigious designations: Certified Residential Specialists (CRS), Internet Specialist (e-PRO), Graduate Realtors Institute (GRI), Transnational Referral Certified (TRC), and most recently Certified International Property Specialist (CIPS). Steve has earned the GRAR Salesmaster Gold and Salesmaster Awards and has sold over 1,500 homes in his career. Prior to being elected Treasurer, Steve was on the Greater Rochester Association of REALTORS® Board of Directors for two years. He is also currently in the middle of serving a 3-year term of Director for the New York State Association of REALTORS®. As Certified Residential Specialist (CRS), Steve was president of the CRS Chapter of New York State for 2004-05 and last year was on the Chapter Policy Review Board for the National Council of Residential Specialists. Licensed in 1983, Rob is an associate broker and has been a Senior Manager for the last 15 of his 25 years with Nothnagle REALTORS®. Over his career, Rob has demonstrated a longstanding commitment to GRAR serving on numerous committees including Communications, Member Services and Grievance to name a few. Rob is a Certified Real Estate Exchange Advisor and has been a member of the Appraisal Institute since 1986. Aside from having his Certified Buyer Representative (CBR) designation, Rob has the recipient of many real estate awards: Nothnagle “TOP 25”, Gold Circle New Home Award, and Nothnagle Home Securities “TOP 30” Award.